Shazam is the must have app for Super Bowl 2012. 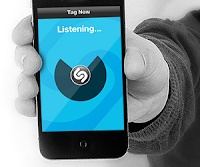 Almost half of all Super Bowl 2012 commercials are Shazam-enabled. Meaning you get a chance to win cars, get free music downloads, receive gift cards, donate to charity and enter sweepstakes for other giveaways. There are supposed over 1 million giveaways enabled by Shazam this Super Bowl. The second-screen experience is now a big trend driven by the iPad. Shazam made the logical jump from tagging and recognizing songs played on the radio to TV programing and ads. Best Buy – Best Buy's spot will feature two of Shazam's founders. Additionally, Best Buy is running a $50 gift card offer for consumers looking to buy and activate a mobile phone in 2012. Pepsi – the new ad that features the winner of the X FACTOR – Melanie Amaro performing Otis Redding’s song “Respect” - will invite people to unlock a free video. Plus, a number of other commercials including GE, Relativity’s new Navy SEALs action-thriller, “Act of Valor” and Disney’s upcoming movie “John Carter" will be Shazam-enabled providing great offers and more. Shazam also will also feature special content during the Super Bowl halftime show in partnership with Bud Light. Even during the game you can use Shazam to get more information about the Big Game. Download Shazam for your mobile device now at Shazam.com.